Cruise ship port is located in Karaköy. And when you get out of the ship the area is perfectly central to Istanbul. Karaköy is exactly where the Golden Horn flows into the Bosphorus. You can easily walk up to Galata Tower or take the nostalgic funicular to Taksim, the modern, lively part of Istanbul. Also if you walk the Galata Bridge you will find yourself in Eminönü and Sultanahmet that are the historical peninsula filled with shops, restaurants and of course museums, mosques and monuments. In case you will travel to somewhere from Istanbul or you will reach your cruise from the airport, a taxi between Karaköy and Atatürk International Airport would cost approximately 50 TRY. If you chose Sabiha Gökçen International Airport it would be much more expensive since Sabiha Gökçen is far away from the city. 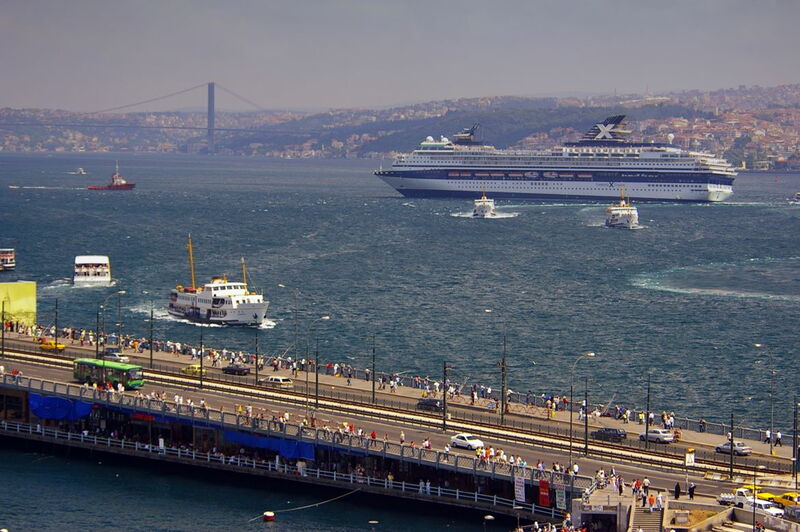 Non-Turkish citizens that arrive in Istanbul by cruise liner and sleep on the ship do not need a visa for a maximum period of 72 hours, with the permission of local security authorities that is given to you when you want to get off your ship. If you are planning to stay longer than 72 hours or if you plan to travel Istanbul before your cruise you are obliged to get a visa. You can see all tourist visa details country by country from here. The main sightseeing spots that are easy to reach from Karaköy port is Eminönü, Sultanahmet, Galata, Taksim, Princes’ Islands and Asia part of Istanbul. Eminönü where Spice Bazaar is located in can be reached after walking along the boardwalk to Galata Bridge and crossing it. The second area is Sultanahmet where most of the museums and mosques are can also be walked if you feel like walking. You need to go left after crossing Galata Bridge and follow the tram rails up the fairly steep hill. Or you can take the tram from Karaköy in the direction of Bağcılar. The first stop is Eminönü, the second is Sirkeci Station, the third is Gülhane (Park) and the next one is Sultanahmet. And taki would cost approximately 9 TRY. There are also few options to reach Taksim. Walking can be harder in this case because it is a steep hill. Taxi would cost 10 TRY. You can take the funicular once you reach Kabataş with the tram from Karaköy. Or you can take the nostalgic funicular from Karaköy until Taksim, Istiklal Street. If you like to sail some more and go to Asia side you can take ferries from Karaköy or Kabataş ferry port. If you’d like to visit Princes’ Islands you should get to Kabataş port with tram or on foot from Karaköy.